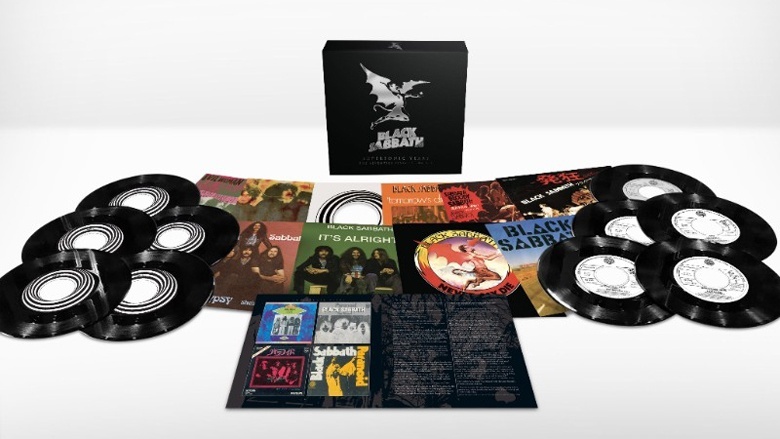 BLACK SABBATH - SUPERSONIC YEARS - THE SEVENTIES SINGLES BOX SET LTD. EDIT. (10x 7” VINYL BOX) | Online Shop | Wizard LTD. Album: "SUPERSONIC YEARS - THE SEVENTIES SINGLES BOX SET LTD. EDIT. (10x 7” VINYL BOX)"
culturally important genre of all time. • The exclusive ‘Henry Devil’ spider-dinc seven-inch adapter that can also be used as a keyring! of their debut single ‘Evil Woman’ in 1970, followed by their ultimate explosive chart success with ‘Paranoid’, the band were not comfortable with the confines of the mainstream pop format and the audience it brought them, leading to their now legendary self-imposed ban on releasing singles in the early 70s. features an array of unique content.